1. The kid who is concerned about Santa's diabetes. 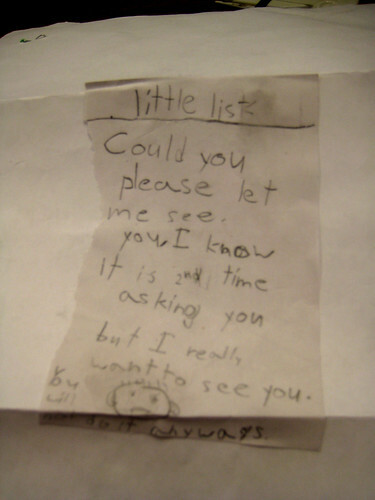 "Dear Santa, please get me some things on my list. And there is some fruit salad & water to help your type 2 diabetes. " 2. The muslim 4th grader. 3. The kid who wants McDonalds for his community. 4. The kid who really likes turtles. 5. The kid who will smooth talk his way through life. I like you. Do you like me? I would like a DS Mario please. Next year I will give you money. How does that sound? Pretty cool. It does to me. That's the deal." "We don’t need very many presents. You can give them to people who don’t have money to buy toys." 7. The kid who just wants to see Santa's face. 8. The kid who is totally not joking about the cookies! Also, a real shield but a fake sword but real armor. Got it, Santa? 9. The kid who believes in Christmas magic. 10. The kid who just wants pizza. 11. The future contract lawyer. 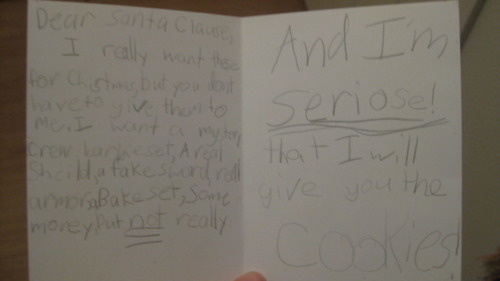 Also, crucial detail, Santa, the money goes in the card. 12. The kid who bullies Santa. I want you to know that I want a puppy and you are not alive, you are fat and stupid. 13. The kid who just wants a couple of small toys and a means of transportation. "A small plane I could ride in." You know, nothing too fancy. Just to get around. I believe in you more than Hanukkah." 15. The kid who wants a baby Jesus. But not a real one! 16. The kid who couldn't be good the whole vacation. 17. The kid whose sister coincidentally wants all of the same things. 18. The Jewish girl who just wants Santa to draw his face. 19. The kid who wants diapers for her brother. You would add diapers to your christmas list too if that happened to you! 20. The kid who wants privacy. 21. The kid with the worst dad. 22. The kid with Republican parents. All I want for Christmas is peace and a Job for my daddy. I am a big boy and I do not want any toys. Mommy said you will not be coming to my house this year because Obama got elected again." 23. The kid who wants to know if Santa is a popsicle. 24. The kid who is curious about how Santa eats his buffalo wings. "You know on the Domino's Pizza ad for buffalo wings? How do you eat these without staining your gloves?" 25. The kid who has the answer to gun control. 26. And this final touching letter.